Whoa, I'm getting the wildest sense of deja vu, because today's guest on the Girlfriends' Cyber Circuit is Carrie Jones, who just a few months ago graced this blog during the Blogtoberfest. Forget that. She’d still probably come. Oh gosh, as a little bit more definitely Nick because he is just sigh-worthy. I know I created him and that feels a little pervy, but he really is. As a friend I’d really like either Zara or Issie. They are both awesome friends. Jeri, there are soooo many. I really still like LOST and FRINGE. I am totally in love with this ancient music group called THE WATERBOYS. Sigh. I am such a fan girl. When I was born the doctors thought I was blind but when I was six months old they realized I could see. I just sort of saw four of everything and in a very blurry way. So, I had an operation when I was one. I have this really distinct memory of suddenly smelling home again and crawling around but not being able to see anything at all, and going behind the couch and touching it. I can still feel the fabric against my palm. I know this can’t possibly be a real memory, but my mom says it did happen. I am really REALLY afraid of downhill skiing, which is ridiculous I know. It's not ridiculous! People get killed and maimed on the ski slopes on a regular basis. Of course, my husband is going skiing with my brother and nephew next weekend while our house is invaded by writers, but I'm not worried about them. Not at all. Anyway, yay Carrie! I mean it sincerely when I say that success could not happen to a nicer, more deserving person. Not that I would ever say that insincerely about anyone. Why waste compliments on the non-nice? Thanks to everyone who donated and/or spread the word about last week's book giveaway to benefit Doctors Without Borders. Because of your generosity, we raised $600 plus 10 pounds sterling! I'll be sending out books ASAP. I have a couple news items this week. I'm psyched to report that Christopher Pike's second Last Vampire compendium, Thirst 2, hit #1 on the New York Times bestseller list for children's paperbacks! Being a selfish person, the reason I'm psyched is because the volume has a sample chapter of Shade at the end. Of course, my immediate thought when I saw the list wasn't, "How wonderful! Loads of readers will be introduced to Aura and her friends." My immediate thought was, "Oh no! People will be coming by the website, and it's a mess!" Actually, the site itself is lovely (thanks, honey! ), but some of the information was out of date. So I spent Sunday making it "company ready" so as not to embarrass myself in front of the two or three new visitors. Not that my loyal readers aren't worth a clean website. But you know how you don't clean your house as well for your mom and your best friend as you do for first-time visitors? It's kinda like that. For instance, the home page and news page no longer say that my next appearance is Windycon, November 13-15. That is SO last year! (Literally.) The news page now even has my complete panel schedule for the RT Booklovers Convention in Columbus, Ohio, April 28-May 2. The other news item can be found subtly listed on the books page. Book Four of the WVMP Radio series (tentatively titled Lust for Life) is now firmly scheduled for August 2011. Since the sequel to Shade, titled Shift, will be out in May 2011, that means I'll have the exact same release schedule two years in a row. Makes it easy for me to remember. Speaking of Lust for Life, I'm not sure if that's going to be the title. I might save it for Book Five (if there ever is a Book Five--that's up to my publisher, or more precisely, up to readers to buy Bring on the Night in sufficiently large quantities this August). But it doesn't really fit Book Four anymore, now that I'm figuring out what the story is all about. A couple weeks ago I wrote that I was going to try this new work scheme where I write 3,000 words a day five days a week and then took weekends off. It went swimmingly for about ten days, then I realized that I'd reached the point where I didn't really know what was going to happen next, I was just coughing up words like so many hairballs. The story was careening out of control. So I decided to take a step back, do some scene-by scene outlining for the first quarter of the book, and now I'm writing one scene a day (or two, if they're short simple scenes). That way I don't bloat up the book with endless dialogue just to make my word count. I'll use this method until it stops working, and then I'll try something else. I envy writers who are able to follow the same process every time. Heck, I can't even sit in the same place in my house more than a week or two at a time before I need a change of scenery. That's all for this week. I'm still grumpy from the Ravens game, so we're lucky I've gotten through this entire post without profanity. FINAL UPDATE: All 20 books have been spoken for, and a total of $480 plus 10 British pounds have been raised for Haiti relief. I am stunned and amazed by your generosity. Thank you from all the squishy little corners of my heart! I hope others consider donating to this worthy cause today and in the weeks to come. The work there, I fear, will not be over for many years, if ever. Words like "devastate" can easily weaken from overuse. "He is devastatingly handsome." Or "I'm devastated they canceled Dollhouse." But when a 7.0 earthquake destroys the capital city of the hemisphere's poorest nation, a nation whose infrastructure was shoddy and piecemeal to begin with, a nation whose people live off the equivalent of $2 per day? That's devastation. Many charitable organizations are pitching in to help those affected by the earthquake in Haiti, including the Nobel Peace Prize-winning Doctors Without Borders. Doctors Without Borders (MSF, which stands for their original French name Medecins Sans Frontieres) is in my opinion one of the bravest and noblest charities in the world. They go into war-torn areas that others won't dare to enter. They operate independent of political, religious, and military affiliations. They speak out against the atrocities and violence they witness in the course of their work. And they don't care who they piss off in their battle for compassion, mercy, and better medical care for those in need. That's why they got the Nobel Peace Prize in 1999, and why I think they deserved it. Let's help MSF help Haiti. I still have a box of 20 trade paperback copies of Bad to the Bone. It's been sitting in my rec room since last May, its contents waiting for a chance to enter the world and maybe make a few people laugh or go, ooh. On February 22, another two boxes of the book will arrive when the mass market version comes out. Basically, my Bad to the Bone cup runneth over, and it's time to share the wealth. If you donate $15 to Doctors Without Borders, I'll send you an autographed, personalized copy of Bad to the Bone while supplies last. 1. Donate at least $15 at the Doctors Without Borders website and forward the donation receipt to me at jeri AT jerismithready DOT com. Then leave a comment to this post--it can be anonymous if you prefer, but this will help other readers gauge how many people have already given. 2. Giveaway will continue while supplies last (20 books). I'll modify this post the moment the target is reached. UPDATE 8:24pm EST: I still have six books left. SECOND UPDATE 8:32am: I have one book left. So far you generous readers have donated $400 (plus 10 pounds)! 3, International readers welcome. However, it costs a bundle to ship a book overseas, so if you are outside the US or Canada, please be a pal and only do this if you really really intend to read the book or give it to someone who will. 4. Retail value of book: $15. Helping doctors help injured, homeless Haitians: priceless. 5. Please allow 6-8 weeks for delivery. 6. I'll personalize the book to you, unless you request otherwise (if you'd like me to sign it to a friend for a gift or simply put "eBay auction winner" ;-). Tidbit Tuesday #2 - new books, music & MISHA IS FAMOUS(ish)! Don't faint. I'm actually doing a weekly feature more than one week in a row. If you need help with the shock, put your head between your legs, or breathe into a paper bag. An empty paper bag. First, as always, les livres! (Sometimes I break into French for no good reason.) Two more of my fellow class of 2K10 members had releases last week. We're already more than 25% of the way through our year's debut novels, and it's only (*checks calendar*) some day in January. Jennifer Hubbard's debut, The Secret Year, came out on Thursday. I picked it up to "leaf through" and spent the next half hour standing in my living room reading the first several chapters. All while the five books I'm in the middle of reading glared at me from various spots in the house (most had to glare through the ceiling and walls). Jennifer also has a wonderful blog that fills me with awe. Irene Latham's Leaving Gee's Bend arrived on the same day. I was psyched to see that it's set in 1930s Alabama and concerns a sharecropper's daughter who sets out on her own to find help for her ailing mother. Being a giant fan of early Delta blues music, that place and time has always fascinated me. For a great interview, check out our fellow classmate Denise Jaden's blog. In music, Vampire Weekend has a new CD out today! They were not a love-at-first-listen band for me, but the songs from their last album really grew on me over the months. The new stuff sounds even better. I've gotten three minor pieces of good news from my agent in the last two days, none of which I can share at the moment (but they're minor, so you're not missing much). But by far the most exciting thing to happen today occurred in this video interview with Jason Scott, owner of and Twitter transcriber for Sockington, the world's most popular cat. Sockington has over a million followers on Twitter (listen to the interview to find out why), including my cat Misha (who has his own Twitter account). Misha, along with several thousand other cats, dogs, rabbits, hamster, geckos, etc., is officially part of Sockington's army. Back in May (May 16, to be exact, three days before the release of Bad to the Bone), I happened to be passing by Socks's page and noticed he was about to pass 500,000 followers. Ten minutes later, he did, then asked Socks Army to "represent" with the American Sign Language sign for cat. Somehow I managed to get Misha in the proper position and sent a link to the photo to Sockington. It was a fun moment of goofing off with my cat, nothing more. Happy Tuesday, folks! I'm starting a new thing (and now that I've called it a "thing" I'll probably never do it again), Tidbit Tuesday (unless y'all prefer "Tuesday Tidbits" or something less cutesy like "Tuesday Trash," or more cutesy like "Tell-It-To-Ya Tuesday," or a Monday night feature called "'Til Tuesday"--hey, I like that one). I'll mention new book/music releases I'm excited about, plus news items I don't have time to elaborate on at the moment. --First, the books! Two fellow Class of 2K10 members have their very first books out today and tomorrow (and another on Thursday, which I'll mention then). 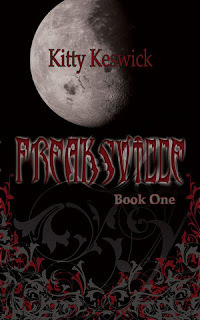 Today marks the release of Kitty Keswick's Freaksville. You can read more about it at her launch post, including a short interview with her brilliant editor at Leap Books. Bonnie Doerr's debut, Island Sting, comes out tomorrow. I'm particularly excited about this because it features an environmental theme. I tried twice unsuccessfully to get a "green" novel published, so I'm cheering for this one to do well so we see more of them in the future. Also, she's a big fan of one of my favorite authors, Carl Hiaasen, so I know the book has to rock. There's a great interview with Bonnie over at Aurora's Reviews. --Speaking of Class of 2K10, the Page Turners blog did a mini-interview with all of us, asking about our first lines, how and whether they changed from first draft to final. --The last book I wanted to mention is actually a repackaging/re-release of three YA vampire novels, but it's very important for one reason. At the back of the second and final Christopher Pike Last Vampire compendium (Thirst #2) is...the first chapter of Shade! Thirst #2 comes out today, but my copy arrived last Friday. Seeing Aura's words in bound printed form gave me the chills, and it wasn't just because I'd left the door open in my excitement to open the box. I'll probably wait until February to put the first chapter up on the website, so if you want to read Shade's first chapter, go check it out--the Pike books are excellent, too! Thirst #1 hit the New York Times bestseller list. If you haven't heard of The Last Vampire series, you're in for a real treat. Instead of writing 2,000 words every day, including weekends, while trying to keep up with Stuff (blogging, e-mail, interviews, etc. ), I'm going to start writing 3,000 words every weekday and take weekends off to catch up on Stuff and catch my breath. This will allow me to have a more single-minded (some would say simple-minded) focus. Weekdays = writing; weekends (and some weekday evenings) = other. My brain likey! So far so good after two days, but we'll see how it goes. Right now I'm off to play one of the two new Wii games we got for Christmas. After all, stress reduction is one of my goals for the New Year, and not making that goal will totally stress me out! Happy New Year! I'm thrilled to start things off by introducing you to one of my fellow travelers on the Girlfriends' Cyber Circuit, Eileen Cook. Her latest novel, Getting Revenge on Lauren Wood, comes out tomorrow. Some fantastic authors had lovely things to say about Eileen's previous book, What Would Emma Do? I like all my characters, but I’m also mean to them. As the writer I seem to go about making their lives as miserable as possible. I’m not sure I would want to be any of them in the middle of the book- unless I already knew how things would work out! My first book, Unpredictable, was about a woman who pretends to be a psychic to get her ex-boyfriend back. When I was researching the novel I went to over a dozen psychics looking at how they did their readings. There were some that seemed to have some interesting abilities, but there were some that after awhile I figured out how they were faking it. It was a ton of fun. I remember at Christmas I was small enough to lie under the Christmas tree and it was almost like a living green tent. I loved the smell of the pine and the lights. My parents would act like they didn’t know I was under there and I thought I was very clever. When I was older I used to be so sad when it came time to take down the tree. I would cry. My parents would get me out of the house, take down the tree and then leave a note to me from the tree saying it had to go back to the forest to be with his family. I had no idea there was such a thing as The Chipper. One of the downsides of being a writer is that you have a very active imagination. I can freak myself out without even trying hard. Once I woke up in the middle of the night to go the bathroom and saw that there was a spider hanging mere inches from my face. I stayed up the rest of the night thinking about how it could have kept lowering itself until it was ON MY FACE. What if it crawled into my nose and laid spider baby eggs in my sinus cavity? Would they eat my brain? Would I go crazy? I also have a fear of dentists, but I don’t think that is irrational. People who stick sharp pointy sticks into your gums and use power tools on your teeth are scary. Oooh hard question. There are so many great writers that I would love to work with. If I have to pick just one, (versus taking your blog over for months at a time while I go through the list) I would pick Judy Blume. I loved her books growing up and I really admire her career and involvement in the community. Plus, who wouldn’t want to say they had Judy Blume as a friend? Happy Release Week, Eileen, and thanks for including me on your tour! ...and only this post, as a result of clicking on "Current Contests and Reader Giveaway," then that means there are, sadly, no current contests or giveaways. I had to create this post to keep that link from taking you to a dark and scary place known as PAGENOTFOUND (which I believe is a German term that roughly translates as "Psych!"). For more contests and giveaways, please come back another time, and/or join my quarterly-ish mailing list. The signup box is on the blog sidebar to the right. Thanks so much for stopping by the blog. Better luck next time!